Shifting the focus of Atlantic World studies to the Iberian peninsula, this volume reveals how Andean travelers to the Spanish royal court helped to construct, maintain, and transform transoceanic networks of power. After the Spanish victories over the Inca claimed Tawantinsuyu for Charles V in the 1530s, native Andeans undertook a series of perilous trips from Peru to the royal court in Spain. Ranging from an indigenous commoner entrusted with delivering birds of prey for courtly entertainment to an Inca prince who spent his days amid titles, pensions, and other royal favors, these sojourners were both exceptional and paradigmatic. Together, they shared a conviction that the sovereign’s absolute authority would guarantee that justice would be done and service would receive its due reward. As they negotiated their claims with imperial officials, Amerindian peoples helped forge the connections that sustained the expanding Habsburg realm’s imaginary and gave the modern global age its defining character. 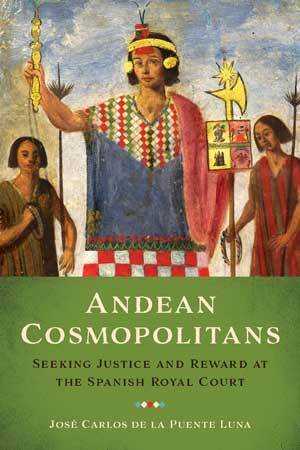 Andean Cosmopolitans recovers these travelers’ dramatic experiences, while simultaneously highlighting their profound influences on the making and remaking of the colonial world. While Spain’s American possessions became Spanish in many ways, the Andean travelers (in their cosmopolitan lives and journeys) also helped to shape Spain in the image and likeness of Peru. De la Puente brings remarkable insights to a narrative showing how previously unknown peoples and ideas created new power structures and institutions, as well as novel ways of being urban, Indian, elite, and subject. As indigenous people articulated and defended their own views regarding the legal and political character of the “Republic of the Indians,” they became state-builders of a special kind, cocreating the colonial order. De la Puente is an associate professor of history at Texas State University. He is the author of Los curacas hechiceros de Jauja: Batallas mágicas y legales en el Perú colonial and coeditor of El quipu colonial: estudios y materiales.